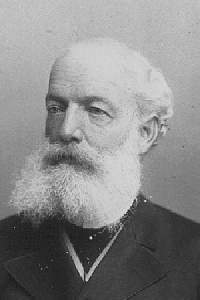 Friedrich August Kekulé von Stradonitz (also August Kekulé) (September 7, 1829 – July 13, 1896) was a German organic chemist. One of the most prominent organic chemists in Europe from the 1850s until his death, especially in the theoretical realm, he was the principal founder of the theory of chemical structure. Kekulé was born in Darmstadt, Germany, the son of a civil servant. In his youth, he was said to be affable, extroverted, and involved in sports. He was also good at sketching, which may have affected his parents' decision to encourage their son to study architecture. In 1847, Kekulé entered the University of Giessen, to pursue a degree in that area. After hearing the lectures of famed scientist Justus von Liebig, however, he decided to study chemistry. In 1849, after obtaining his parents' permission and financial backing for the career change, he pursued the study of his new field, continuing to work with Liebig, who later offered Kekulé an assistantship. Kekulé declined Liebig's offer, and continued his studies in Paris, where he met eminent chemists such as Charles Wurtz and Jean-Baptiste Dumas. He completed his doctorate in 1852, and briefly acted as a laboratory assistant in Switzerland, then traveled to London in 1853, and worked at St. Bartholomew's Hospital. It was there that he met Alexander W. Williamson, who was interested in the classification of organic compounds, and who had synthesized a class of organic compounds called ethers. It was during his stay in London, Kekulé said, that he had one of his dreams, or visions, of atoms and molecules in rapid motion forming various combinations, which he said led to his many discoveries. In 1856, Kekulé became Privatdozent at the University of Heidelberg. In 1857, he published a paper in which he describes his theory of tetravalency for carbon, meaning the four linking points to which other atoms can attach themselves to a carbon atom to form the molecule of a new substance. Another scientist, Archibald Scott Couper, published similar results only months after Kekule. In 1858, he was hired as full professor at the University of Ghent, then in 1867 was called to Bonn, where he remained for the rest of his career. Basing his ideas on those of his predecessors, such as Williamson, Edward Frankland, William Odling, Charles Adolphe Wurtz, and others, Kekulé was the principal formulator of the theory of chemical structure (1857-58). This theory proceeds from the idea of atomic valence, especially the tetravalence of carbon (which Kekulé announced late in 1857) and the ability of carbon atoms to link to each other (which he announced in May 1858), to the determination of the bonding order of all of the atoms in a molecule. Archibald Scott Couper independently arrived at the idea of self-linking of carbon atoms (his paper appeared in June 1858), and provided the first molecular formulas where lines symbolize bonds connecting the atoms. Kekulé's most famous work was on the structure of benzene. In 1865, Kekulé published a paper in French (for he was then still in Francophone Belgium) suggesting that the structure contained a six-membered ring of carbon atoms with alternating single and double bonds. The next year, he published a much longer paper in German on the same subject. The empirical formula for benzene had been long known, but its highly unsaturated structure was challenging to determine. Archibald Scott Couper in 1858, and Joseph Loschmidt in 1861, suggested possible structures that contained multiple double bonds or multiple rings, but the study of aromatic compounds was in its very early years, and too little evidence was then available to help chemists decide on any particular structure. Kekulé used evidence that had accumulated in the intervening years to argue in support of his proposed structure, which is likely why it gained such widespread acceptance. 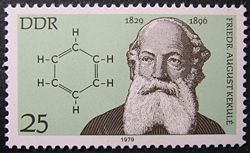 The new understanding of benzene, and hence of all aromatic compounds, proved to be so important for both pure and applied chemistry that in 1890, the German Chemical Society organized an elaborate appreciation in Kekulé's honor, celebrating the twenty-fifth anniversary of his first benzene paper. Here Kekulé spoke of the creation of the theory. He said that he had discovered the ring shape of the benzene molecule after having a reverie, or day-dream, of a snake seizing its own tail (this is a common symbol in many ancient cultures known as the Ouroboros). This vision, he said, came to him after years of studying the nature of carbon-carbon bonds. It is curious that a similar humorous depiction of benzene had appeared in 1886, in the Berichte der Durstigen Chemischen Gesellschaft (Journal of the Thirsty Chemical Society), a parody of the Berichte der Deutschen Chemischen Gesellschaft, only the parody had monkeys seizing each other in a circle, rather than snakes as in Kekulé's anecdote. Some historians have suggested that the parody was a lampoon of the snake anecdote, possibly already well-known through oral transmission even if it had not yet appeared in print. Others have speculated that Kekulé's story in 1890 was a re-parody of the monkey spoof, and was a mere invention rather than a recollection of an event in his life. Kekulé's 1890 speech in which these anecdotes appeared has been translated into English. If one takes the anecdote as the memory of a real event, circumstances mentioned in the story suggest that it must have happened early in 1862. The other anecdote he told in 1890, of a vision of dancing atoms and molecules that led to his theory of structure, happened (he said) while he was riding on the upper deck of a horse-drawn omnibus in London. If true, this must have occurred in 1855. In 1895, Kekulé was ennobled by Kaiser Wilhelm II of Germany, giving him the right to add "von Stradonitz" to his name, referring to an ancient possession of his family in Stradonice, Bohemia. Of the first five Nobel Prizes in Chemistry, his students won three. Kekulé never used his first given name; he was known throughout his life as August Kekulé. After he was ennobled by the Kaiser in 1895, he adopted the name August Kekule von Stradonitz, without the French accent aigue over the second "e." The French accent had apparently been added to the name by Kekulé's father during the Napoleonic occupation of Hesse by France, in order to indicate that the name had three syllables, and not just two (as a Frenchman would presume from the spelling). ↑ Translated into English by D. Wilcox and F. Greenbaum, Journal of Chemical Education, 42 (1965), 266-67. All links retrieved December 5, 2016. This page was last modified on 6 December 2016, at 00:16.